Worst ‘Big Momma’s House’ movie ever. I know, right? How can that be? Don’t get mad at me because I just watch these movies like you do. I was hoping, as I was entering the theater, that I was about to see the penultimate ‘Dude pretending to be an old woman’ movie. I wanted to see a movie that would make Dustin Hoffman stand up and say ‘Damn! I wish ‘Tootsie’ was this good!’ Dustin was pretty damn quiet while I was watching this movie, just like the majority of the audience. ‘Big Momma’s Like Father, Like Son’ had its comedic moments… but a few funny moments in a one hundred plus minute movie that claims to be a comedy… well… it’s just not enough. And where in the heck was Nia Long? Allrightythen. Agent Malcolm Turner (Martin Lawrence) is back and this movie starts out with Agent Turner chasing down a mailman played by Ken Jeong. Now Ken Jeong is almost money in the bank when it comes to giving you a good two minutes worth of cameo funny in a movie. This scene was not funny. We are in trouble. Malcolm chased down this guy because he wanted to see the Duke University acceptance letter for the little boy Trent from that first movie, now all grown up and looking like Brandon T. Jackson. But Trent has other plans and would much rather be The Prodigy, a promising hip-hop star, as opposed to wasting his time getting some worthless education. Okay, so how do these two grown men get from there and end up dressing like women at an all girl’s high school? Trent, doing something stupid, witnesses evil mobster Chirkoff (Tony Curran) kill this guy. The dead guy hid some important information that can put Chirkoff away at this girl’s school… just roll with it… Malcolm needs to hide out Trent until he can find this thing so Big Momma returns with her niece Charmaine in tow… We’re still just rolling with it… and apparently there’s a leak at the FBI. This leak never gets plugged so don’t really worry about it too much, in fact don’t worry about much of anything in this movie and just get set to watch Martin and Brandon T. engage in some funny stuff, zaniness and mad shenanigans dressed up like fat chicks. What else? Trent meets an insanely lovely girl named Hayley as played by the insanely lovely Jessica Lucas. Oddly enough I think the last time I saw Jessica Lucas in a movie she was playing a high school senior in ‘ATL’ and five years later the girl is still a high school senior. Brandon T. Jackson and Jessica Lucas. Oldest High Schoolers Ever. Luke Perry and Jason Priestly just dropped a text to let me know that they think those two are too old to be in high school. Anyway, eventually the mobsters show up but that’s so unimportant in this movie that rests absolutely everything on Big Momma and Lil’ Momma being funny. Fail, of course. But that’s just me talking. So I’m watching this movie and some young people in front of me start having a conversation. Usually people talking in the middle of a movie pisses me off to no end, but I gotta admit that this conversation was pretty engaging. Considering. I even joined in. ‘Darnell did WHAT? Oh no he didn’t!’ I gave this young lady some critical advice on how exactly to handle Darnell next time he does some stupid stuff like that again. There’s a good chance while me, Lucretia and Andale were engaged in this conversation that Big Momma did something funny and we missed it, but I doubt it. 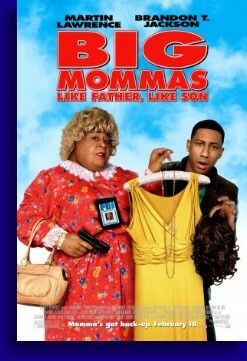 But seriously… ‘Big Momma’s Like Father, Like Son’ wasn’t very funny in case I haven’t made that clear. In fact there were long stretches in this movie that were actually painful in their lack of funny. There was a scene were Jessica Lucas’ character was threatening to take off her bra and that was pretty exciting, but it’s like a PG movie or something so we know that wasn’t going to happen, but it did lighten things up a bit. But the movie did have its comedic moments, with most of these moments being supplied by Faizon Love as the love sick janitor, but he was funny. Ana Ortiz as the schoolmarm is pretty damned hot, but if you watch ‘Ugly Betty’ you know this already. We’ve already addressed Jessica Lucas’ hotness, and in fact all of the way-too-old young ladies playing high school chicks in this movie were pretty toasty. Being hot isn’t particularly funny, but it is something. Lastly, Brandon T. and Jessica… or maybe their voice doubles because I don’t know for sure… sing this little duet and it was kind of infectious. So sweet was this little love song that they played it twice in its entirety. I’m not in the movie business so I am nowhere near qualified to tell these highly paid executives and movie stars how to go about doing their business, but maybe ‘Big Momma’ has run its course? Maybe? Oh wait, I just got a brilliant idea on how to save two failing, no longer funny movie franchises. Check it out… ‘Big Momma babysits the Little Fockers’! Why I’m not in the movie business with inspired conceptualizations like that is mystery to everyone.